The California Brown Pelicans are putting on their best colors to get ready for mating season. This photo was actually taken on an overcast day, so I increased saturation a bit during the raw-to-jpeg conversion to bring out the colors. Two things come to mind when talking about this image. One is composition. I was rather lucky to get these two to arrange themselves so perfectly. More remarkable than their relative placement, however, is the fact that there are no other birds cluttering up the image, since there were dozens of birds–pelicans and seagulls–just outside the frame. Not much one can do, of course, other than wait. The other comment I’d like to make is about depth of field. Since the two pelicans were not at the same distance from the camera, there needs to be enough depth of field to have both birds in sharp focus. On the other hand, one doesn’t want too much depth of field, but would prefer the background to be as out-of-focus as possible so that it becomes less distracting. Since I didn’t have much time, I guessed f/11 and checked the eyes of both birds on the camera LCD. As it turns out, I got pretty close to the best setting. The focus distance was about 37 feet (11.3 meters), and according to my depth-of-field calculator everything between 33.5 and 41 feet would have been reasonably sharp. It’s important to remember that there is always less depth of field in front of the focus point than there is behind it. Therefore, if you need objects at two distances to be in focus and it’s not feasible to focus in between them, focusing on the nearer of the two objects is the better choice. 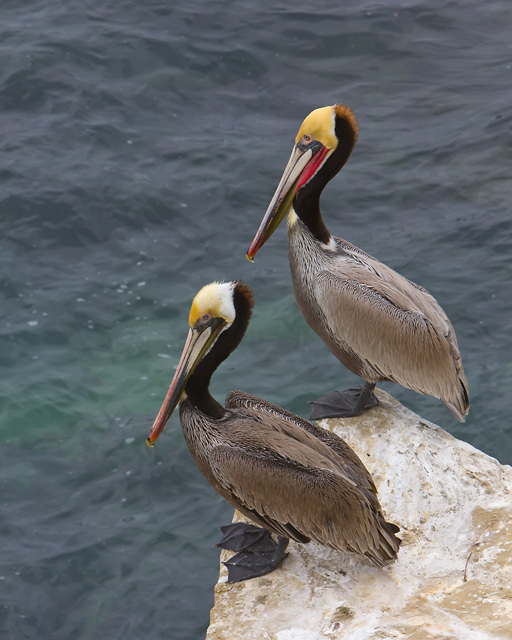 This entry was posted in Picture of the Week and tagged brown pelicans. Bookmark the permalink.